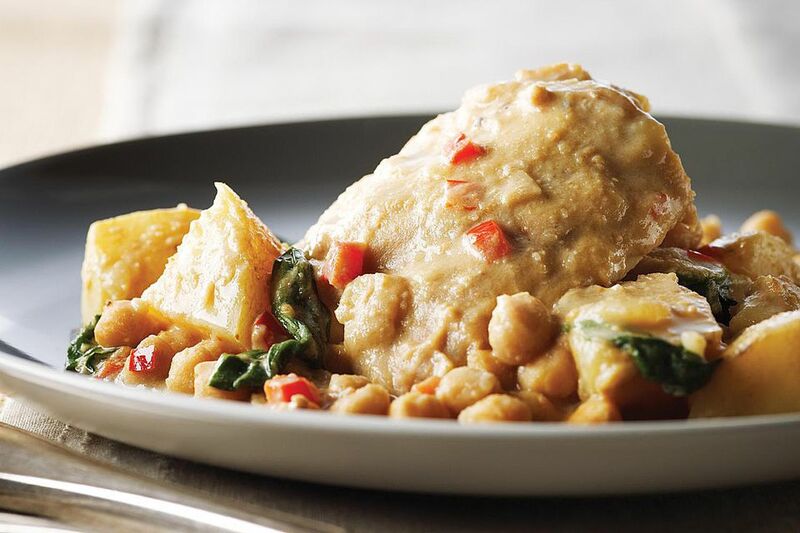 This super simple recipe for Crockpot Peanut Chicken is packed full of flavor. There's something so wonderful about a delicious ethnic recipe like this one. In Thailand, chicken is often cooked with peanut butter. The peanut butter adds such a wonderful rich taste and smooth and velvety texture to the sauce. And the chicken is very tender and succulent. While this recipe calls for chicken breasts, it can also be made with boneless, skinless chicken thighs. The thighs will take a bit longer to cook. Make sure that the chicken, whether light or dark meat, is cooked to 160°F as measured with an instant read meat thermometer. If you like spicy foods, this recipe can certainly be made with minced jalapeño or habanero peppers, or add some crushed red peppers or cayenne pepper. I developed this recipe to be more mild for my family's taste. Make sure that you taste the recipe before you serve it to make sure that it is seasoned as you like it. You can also add vegetables to the recipe. Some sliced mushrooms, chopped onion, or minced garlic would be nice. You could also add a chopped red or orange bell pepper to the slow cooker. Because this dish is so rich, serve it with some simple side dishes. A steamed vegetable, such as asparagus or green beans, would be a nice accompaniment. Serve a fresh fruit salad or a crisp and cool green salad, or a cucumber salad for a flavor and textural contrast. Spray a 4-quart slow cooker with nonstick cooking spray. Combine the chicken, peanut butter, orange juice, chicken broth, soy sauce, brown sugar, ground ginger, pepper, and garlic powder in prepared crockpot; mix well. Cover the slow cooker and cook on low for 5-8 hours or until chicken is tender and thoroughly cooked. You can leave the chicken whole or cut it into slices or chunks before serving. If you cut it up, this recipe can be served almost as a stew. Serve with hot cooked rice or noodles and sprinkle with the chopped peanuts. If you have a newer hotter cooking crockpot, check the chicken after 4-1/2 hours. The peanut butter can burn easily, so watch it.